When I heard that Jonathan Franzen' new book Purity had been released, I had to drop everything else and pick it up on my Kindle. 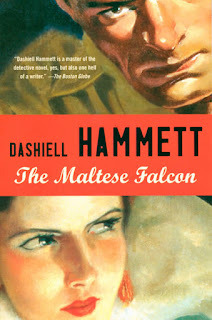 That meant finishing Dashiell Hammett's (whose name I still have trouble spelling) The Maltese Falcon in more or less one sitting. The Maltese Falcon is apparently better known to some as a Humphrie Bogart movie, but it's a damn fine novel in its own right. I remember enjoying Red Harvest, also by Hammett, and The Maltese Falcon offers more of the same hard-boiled detective action. The prose is pristine, the characters charming but perhaps a bit one dimensional. It's hard to read The Maltese Falcon and not draw on our almost stereotypical view of the genre. But I guess the storytelling and characterization were innovative in its day. It's just that some parts - the lady in distress, the private eye, the laced scotch - you've already seen somewhere else. Today, bits and pieces from Dashiell Hammett's works have been used in everything from Donald Duck to Stieg Larsson. At times it's like listening to Duke Ellington: you know it's brilliant but you can't shake off the feeling that you've heard it before. That did not make me love The Maltese Falcon's prose any less. I wish I could write like Hammett and so did Hemingway. "The cheaper the crook, the gaudier the patter", says Sam Spade offhandedly but captures so many emotions in one sentence that I have trouble counting them. It's uncanny how well parts of The Maltese Falcon are written. I wondered if anyone ever again would reach those heights. I did have one problem with The Maltese Falcon. It whisks the reader through an exhilarating first act that has readers on their toes throughout. Everything is set up neatly, characters are introduced and the tone is set. For some reason, however, Hammett over indulges in explaining every plot point near the end of the second act. It slows down the action but does not provide additional depth. One conversation in particular, regarding the attempt to frame a murder on a young boy, goes on forever without really showing the reader anything new. All in all, it's a minor gripe for what is a brilliant piece of fiction.